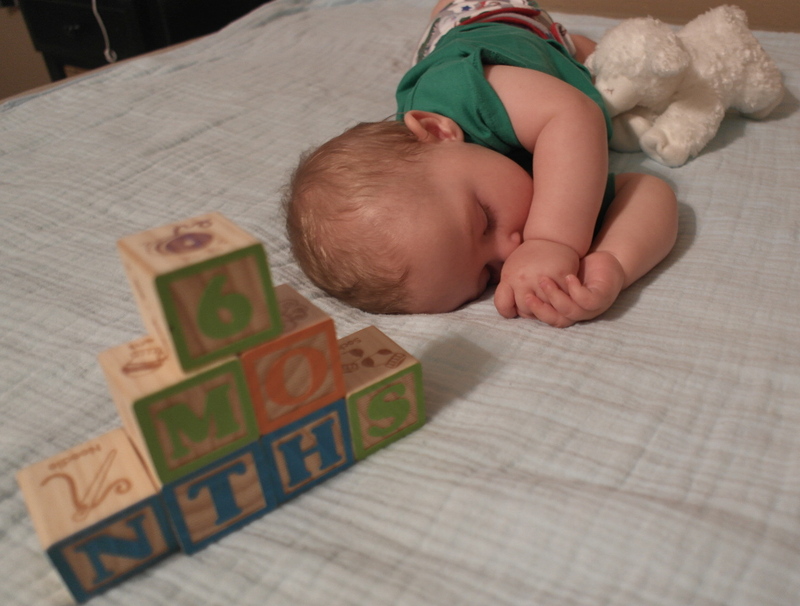 Happy 6 Months, Little Buddy! Six months ago today, I was frantically raking leaves in our front yard, trying to keep my mind off of the fact that this baby still was inside my stomach. Much later that night (two hospital trips later, to be exact), out “popped” this beautiful baby boy: Lucas Alexander. Now, six months in, I am discovering not only how different my children are, but how different my relationship is with each of them. Maybe it is because I was working so much, or maybe it was because I didn’t have a clue what I was doing, but parenting Lillian has always seemed much more like a group effort than it does with Lucas. And, in all honesty, I love sharing her–she is spunky and fun! With Lucas, I hover a lit (ok, a lot) more. And, when I’m not hovering, Lillian is there reminding me that he needs attention (“Mommy, Buddy’s hungry; he wants milk.” “Mommy, Buddy’s crying.”). And, while I would love to say that Lucas feels more like “my baby,” I can’t. He is definitely Lillian’s baby. And, really, I hope that never changes. Watching their sweet relationship grow makes me feel pitter-patters that I didn’t know existed. It also means that I get to enjoy the rare opportunity to have one-on-one time with Lucas. And, while I always think I’m going to get the house cleaned out or the laundry back to zero while I only have one child present, it never happens. Instead, partly because he doesn’t have Lillian to entertain him and partly because I just want to, I end up spending most of the time cuddling my tiniest person. Oh, and taking pictures (because we don’t have enough of those). But, in these moments, I get to see how his personality is beginning to shape. And, I might be a little biased, but I think he’s going to have a pretty good one. Happy half-birthday, Buddy! We sure are glad you are ours!